Sweden is currently battling outbreaks of wildfire this summer. Hot weather and low levels of rainfall has seen forest fires ravaging parts of the country, including as far north as the Arctic Circle. Data from the European Commission’s Joint Research Centre reveals there has been 53 wildfires up until July 19 this year. Its historical data — which works out an average for the last decade — shows normally by this time of year there would have been three such fires. In addition the amount of burned land stands at 9,431 hectares so far this year, compared with an average of 448 hectares between 2008 and 2017. 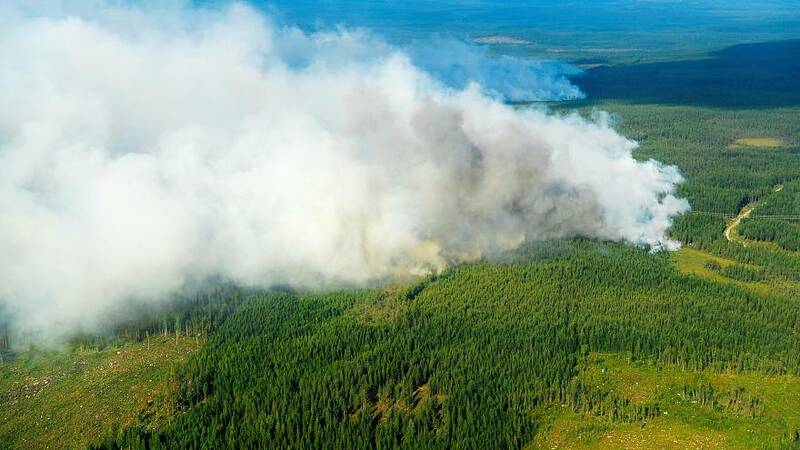 Authorities said there were 35 registered wildfires burning on Thursday, affecting more than 20,000 hectares across the heavily forested Nordic country. Several villages in the worst hit municipality of Ljusdal in southern-central Sweden were evacuated overnight. On Thursday Prime Minister Stefan Lofven visited the area, where fires were burning across some 8,500 hectares. Soldiers, coastguards and civilian groups were helping firefighters to contain the fires. Two Italian fire fighting planes and Norwegian helicopters were helping with water bombing affected areas. France was also expected to provide two firefighting planes on Thursday after Sweden appealed to the European Union for more outside help. Many parts of Sweden have seen their driest weather in the May to mid-July period since records began in the 19th century, the Swedish Meteorological and Hydrological Institute (SMHI) said, and there are few signs of the drought coming to an end.